What is the Global Fishing Watch map? 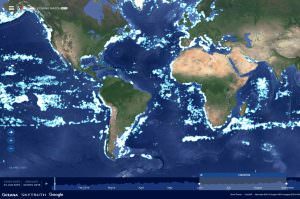 The map gives the public a way to see the tracks of commercial fishing vessels at sea in near real-time. Using our freely accessible map, anyone is able to analyze historical data, dating back to 2012, upload their own datasets to deepen and broaden their own analyses and save and share their work. This layer uses data provided by the Peruvian Government’s Ministry of Production. The data is collected using their Vessel Monitoring System (VMS) via satellites and terrestrial receivers, and contains a vessel identities, gear type, location, speed, direction and more. We analyze this data using the same algorithms developed for AIS data to identify fishing activity and behaviors. 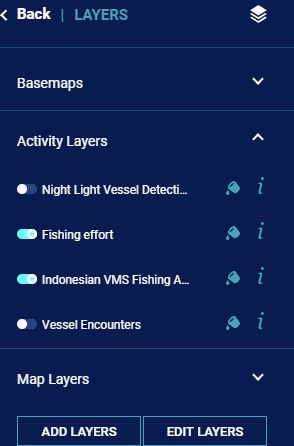 The algorithm classifies each broadcast data point for these vessels as either apparently fishing or not fishing and shows the former on our fishing activity map. Check out the VMS data in our map. To construct this layer, our platform ingests boat detections processed from low light imaging data collected by the U.S. National Oceanic and Atmospheric Administration (NOAA) Visible Infrared Imaging Radiometer Suite (VIIRS). “AIS” stands for the Automatic Identification System. It is a maritime navigation safety communications system standardized by the International Telecommunication Union (ITU) and adopted by the International Maritime Organization (IMO) that provides vessel information, including the vessel’s identity, type, position, course, speed, navigational status and other safety-related information automatically to appropriately equipped shore stations, other ships and aircraft; automatically receives such information from similarly fitted ships; monitors and tracks ships; and exchanges data with shore-based facilities. The unique identification of a vessel’s radio transmissions assigned to it by its national licensing authority. The type of AIS transponder a vessel uses – Class A transponders are the most expensive and transmit at 12.5 watts. There are two types of Class B transponders – Class B/SO, which transmits at 5 watts (2 watts @ low power) and Class B/CS receiver, which transmits at 2 watts. Global Fishing Watch uses data about a vessel’s identity, type, location, speed, direction and more that is broadcast using the Automatic Identification System (AIS) and collected via satellites and terrestrial receivers. AIS was developed for safety/collision-avoidance. Global Fishing Watch analyzes AIS data collected from vessels that our research has identified as known or possible commercial fishing vessels, and applies a fishing detection algorithm to determine “apparent fishing activity” based on changes in vessel speed and direction. The algorithm classifies each AIS broadcast data point for these vessels as either apparently fishing or not fishing and shows the former on the Global Fishing Watch fishing activity heat map. AIS data as broadcast may vary in completeness, accuracy and quality. Also, data collection by satellite or terrestrial receivers may introduce errors through missing or inaccurate data. Global Fishing Watch’s fishing detection algorithm is a best effort mathematically to identify “apparent fishing activity.” As a result, it is possible that some fishing activity is not identified as such by Global Fishing Watch; conversely, Global Fishing Watch may show apparent fishing activity where fishing is not actually taking place. For these reasons, Global Fishing Watch qualifies designations of vessel fishing activity, including synonyms of the term “fishing activity,” such as “fishing” or “fishing effort,” as “apparent” rather than certain. Any/all Global Fishing Watch information about “apparent fishing activity” should be considered an estimate and must be relied upon solely at your own risk. Global Fishing Watch is taking steps to make sure fishing activity designations are as accurate as possible. Global Fishing Watch fishing detection algorithms are developed and tested using actual fishing event data collected by observers, combined with expert analysis of vessel movement data resulting in the manual classification of thousands of known fishing events. Global Fishing Watch also collaborates extensively with academic researchers through our research program to share fishing activity classification data and automated classification techniques. The state a vessel is registered or licensed under. The IMO number is a unique vessel identification number assigned by the International Maritime Organization (IMO) to sea-going ships under the International Convention for the Safety of Life at Sea (SOLAS). Fishing vessels of 300 gross tonnage or more engaged in international voyages are required to broadcast AIS by the the IMO. MMSI stands for Maritime Mobile Service Identity. It is a unique nine-digit number assigned to every Automatic Identification System (AIS) transmission made by a vessel. A vessel’s name. Vessel names can be changed without notice, and are often used by multiple vessels so the name alone is not a robust form of identity.